Chicago is a city built on Lake Michigan in the state of Illinois. One of the biggest US cities, it’s famous for its towering skyscrapers and stunning skyline set off against the sea. Some of the biggest and most popular towers in the city are the John Hancock Center, the Willis Tower, and the Tribune Tower. In addition to the modern architecture, the city is also known for its art museums. When you travel to Chicago you should stay in a luxury five star hotel that can accurately represent the bold architectural wonders of the city itself. 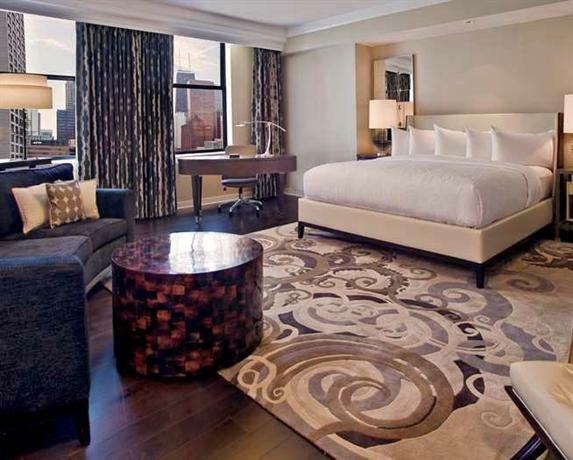 In this article we’ve compiled the best luxury hotels in Chicago. The Peninsula is a very well connected luxury hotel which situated just five minutes from prime tourist attractions such as the Museum of Contemporary Art, and the Hancock Center observatory. However, if you’d like to go to the Navy Pier, or the Millennium Park, you’ll need to walk for about 25 minutes, or take a taxi. Aesthetically speaking, the hotel is largely Art-Deco, however it has a few oriental touches as well. For example, the entrance to the hotel is guarded by two stone Chinese lions. The lobby floors are made of marble, and they sparkle with the reflection of the glittering chandeliers. The walls are lined with paintings with engraved picture frames, and dense brocaded curtains. There are 339 rooms in this luxury hotel and they’ve all been designed fabulously with creamy-beige furniture leather interspersed with ebony wood. The rooms also hold amenities such as a walk-in closet, large TVs, and even a desk with a fax machine and a scanner. The rooms also come equipped with their tablets with which to view entertainment or control the temperature, lighting, etc. The bathrooms are really luxurious with a bath tub, separate shower, and a TV hanging over the bathtub so you can be entertained even as you bathe. You can also avail of the Concierge services and get yourself some tickets for events in the city, or go aboard a boat cruise during the day. 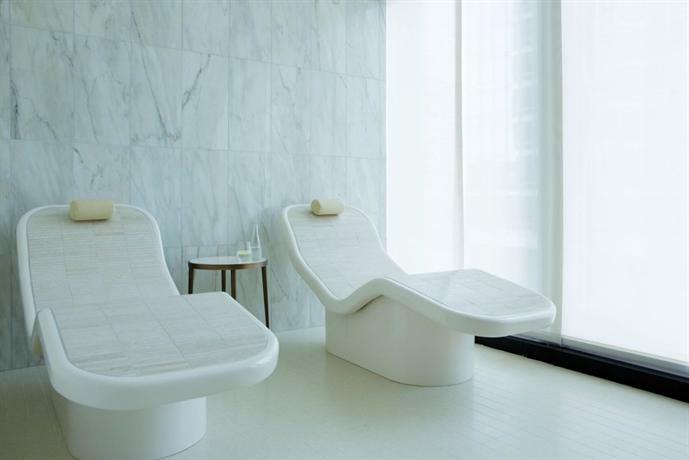 The hotel’s 19th and 20th floors feature amenities such as a lap pool, a spa, and even a gym. As such, you have everything you could possibly need in the hotel. Perhaps the most stunning thing about this five star hotel is the fact that the waters of the Chicago River flow so close to it that they almost reach the entrance. One of Chicago’s main districts — the Loop — is just two blocks south of the hotel and can easily be reached on foot. If you’d like to see the whole of the city from a vantage point over the rooflines, you can hop aboard the L station, which is just a five minute walk away from the hotel. The building that houses The Langham was designed by famed German designer Ludwig Mies Van Der Rohe, and it’s the only hotel in the world to have been designed by him. As such, the Langham Chicago is quite an iconic building even architecturally speaking. The lobby is replete with marble and bronze fixtures, and the whole hotel is really quite extravagant and opulent. One of the things this hotel is often complimented for is the service provided by the staff who are always helpful, friendly, and even interesting to chat with! The primary colors in the rooms are dark wood, beige, cream, and pristine white. Even though the rooms don’t come with balconies, they all have sweeping floor-to-ceiling windows from which you can look out at the city skyline, if you’re high enough. The Trump International Hotel & Tower is a luxury five star hotel located smack right in the middle of the business district, being opposite to the Loop, and yet it’s also primely positioned for a night of fun as it’s surrounded by several great clubs, restaurants, etc. There are two L stations close to the hotel, both within walking distance. 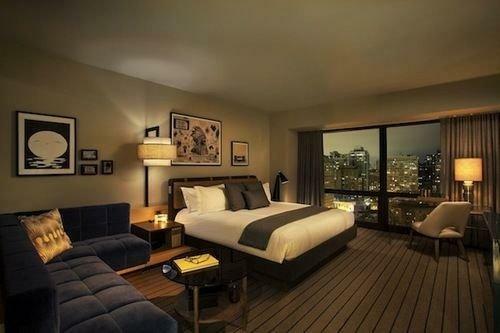 The entire hotel looks over the Chicago River, and as such the rooms come with an exquisite view. This is the second tallest building in all of Chicago, and it’s aesthetically designed in a deeply powerful manner with a lot of concrete and steel. The rooms have been designed in a sleek and minimalist style with grey and dark wood colors predominating. One of the unique things about this hotel is that everything within it, from the toiletries and towels, to the contents of the mini bar, are all branded Trump. The lap pool is available in the 14th floor, and is positioned right next to a sweeping view of the city skyline. They also have an extremely effective concierge service, and you can rely on them to pretty much do anything — go shopping on your behalf, pick up prescription medicines, or even walk your dogs! All of the 339 rooms in the hotel are massive, and even the smallest of the lot are bigger than most Chicago apartments in all. Even the bathrooms are designed flawlessly, and you’ll find a large TV installed on the mirror. In addition to all of this, the rooms have been designed in a way so as to make it possible for you to stay for a long period, they come equipped with a completely furnished kitchen and Nespresso machine. 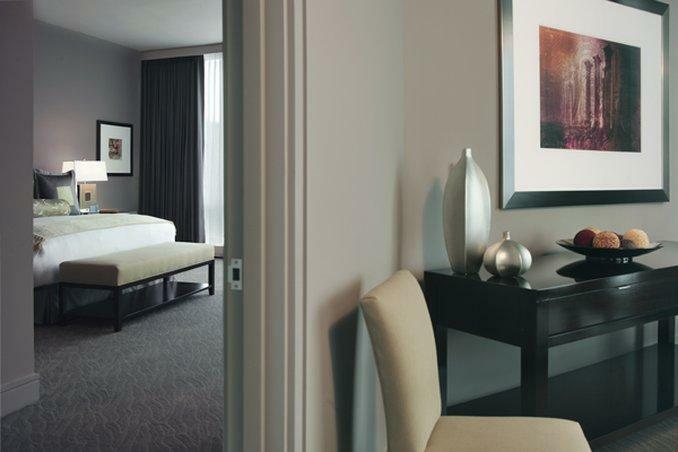 This luxury five star hotel is also located in one of the most luxurious avenues in all of Chicago, just a three minute walk from Michigan Avenue, and all its amazing shopping centers and outlets. If you love shopping, then this is the place to be. In addition to the 400+ shopping stores, the street is also lined with some charming restaurant and roadside cafes. If you’d like to go to the business district of Chicago, you can either take a taxi or if you don’t mind the walk, you can be there in 20 minutes. The lobby has been designed in an ultra-chic aesthetic with shiny black granite floors, large expansive windows, and high ceilings. The resident Café des Architectes is a great place to hang with a fun red and white color palette. The hotel is spread out over 32 floors, and has 415 rooms over all. However, despite that the hotel is able to give off a very homely and intimate feel, because there are only 12 to 13 rooms in every floor. The rooms are all bright with plenty of natural light pouring in, and they offer a lovely view of the city, and even the Michigan lake. There’s no Nespresso machine or coffee available in the rooms, however the restaurants do serve complimentary coffee and tea. In fact, if you wake up early at around 6, then you can even treat yourself to complimentary pastries. 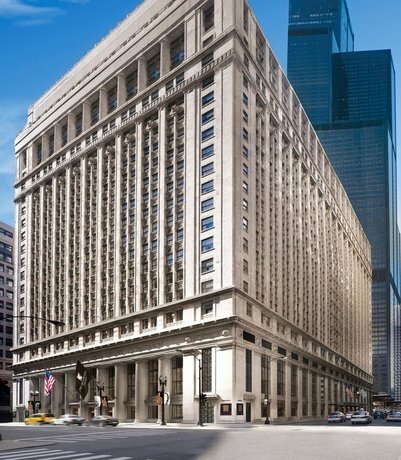 The JW Marriott is ideally located for all business travelers as it’s smack right in the middle of the Financial District/South Loop, within easy reach of the Board of Trade, the Federal Reserve, and other important business institutes. You can even take the L station which is right next to the hotel, and you can walk over to the Willis Tower as well. As such, this luxury hotel is quite well connected to the rest of the city. 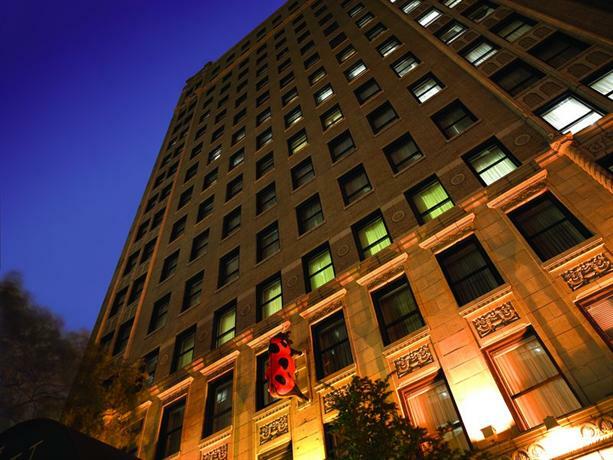 The building on which the hotel is housed used to be a Banking structure when it was first established in the 1900s. The lobby is designed in shades of red and gold, with tinkling chandeliers hanging from the incredibly high ceilings, pillars, and lush suede red couches and furniture to recline against. The hotel features a luxurious spa as well, with 14 treatment rooms, a fireplace, gym, swimming pool, and any other amenities you might need in a luxury five star hotel. There are 610 guest rooms over all, and they’ve been designed in earthy and neutral shades with plenty of natural light streaming in through large windows. The rooms are made to feel homely and they have appropriate furnishing with a work desk and a chair as well. You also have a coffee maker, and a Smart TV with subscriptions to Netflix, Amazon, etc. The bathrooms are spacious and well lit, with separate showers and a bathtub you can completely immerse into. Loews is a quiet and unassuming luxury hotel surrounded by high-rise buildings. It’s a lakefront hotel next to the Chicago River, and the prime attractions of Michigan Avenue and the Navy Pier are just a 5 minutes and 10 minutes walk away, respectively. If you don’t mind walking about 20 minutes, you can also reach other prime stops such as The Art Institute and the Hancock Center Observatory. The hotel has been designed in an extremely modern style with glass exteriors, and the lobby features some rich and comfortable furniture. The rooms are comfortable and large with work desks, an arm chair, and a large king-sized bed. The general color palette is white and grey, which gives the room a sleek and modern, if a little cold, look. The James is a well placed luxury hotel, situated on the River North area, with plenty of restaurants and cafes in the vicinity. Magnificent Mile is one of Chicago’s most famous retail stores, and it’s right around the block from the hotel, and if you're in mood for some pizza, then you can simply stop by Pizzeria Uno which is also walking distance from the hotel. The hotel’s exterior has been designed in a 1920s brick house style, and the interiors are chic and elegant with plenty of natural light flooding in, and a general autumnal hue being the favored color aesthetic. 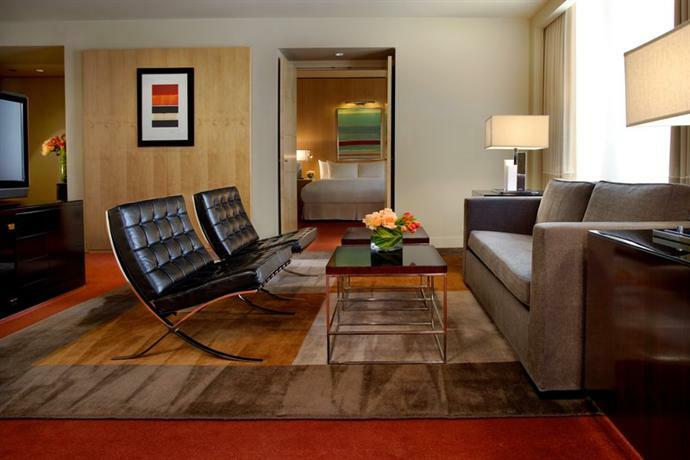 The Gwen is another fabulous luxury hotel which situated in a prime shopping location, just a few steps away from Michigan Avenue, and connected to the wondrous stores of North Bridge via an indoors connecting bridge. The Loop, for all the business travelers, is just a 10 minute walk away, and the El is five minutes away, connecting you to the rest of Chicago. However, the hotel has been designed in quite a heady opulent aesthetic reminiscent of the city in the 20s with intense lighting and a lot of brass fixtures. The rooms have also been designed in a similar fashion, completely dedicated to the Art Deco aesthetic. 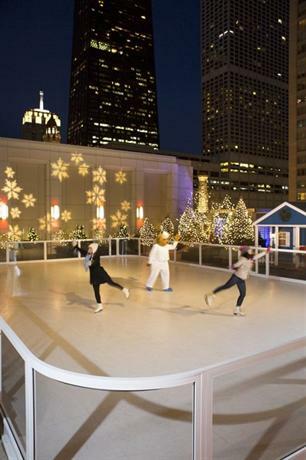 The Radisson Blu Aqua is a luxury hotel located within close vicinity of such prime attractions of the city such as the Millennium Park, and the Lakefront Trail and Riverwalk. If you’d like to hop aboard the L train, you can find one in a ten minute walking distance. 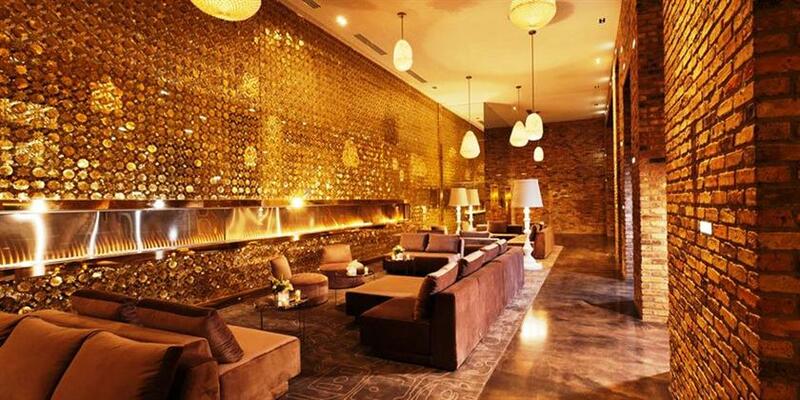 The hotel favors a modern aesthetic with glass walls and black and white murals of the city gracing the walls. The hotel is also a great place to be if you’re a modern art enthusiast. The rooms are designed in a modern style with Art Deco leanings. However, not all rooms have private balconies, so you need to be careful while booking a room. Palomar is a luxury five star hotel just across from the L station, and as such you can simply step out of the hotel and be transported anywhere in the city. If you walk two blocks down the road, you can find yourself in Michigan Avenue with all of its boutique shops and cafes. The hotel is lined with glass walls, and as such it’s very sleek and has plenty of natural light, but it’s also designed in a boxy style. The hotel lobby also features a nightly wine hour when all the guests can gather and socialize and be treated to complimentary drinks. The Thompson is a stunning luxury hotel in the prime Gold Coast area of the city, surrounded by a throng of luxurious fine dining restaurants and boutique shopping outlets. The closest L train is just 10 minutes on foot, and with that you can go anywhere around the city. The Art Institute is just 10 minutes away by train. The hotel has been designed in a way so as to help guests connect better. To achieve this they’ve designed the common areas in the style of living rooms, featuring bookshelves and large comfy chairs you can recline against. Even the walls are graced with eccentric posters that invite you to stop for a second. 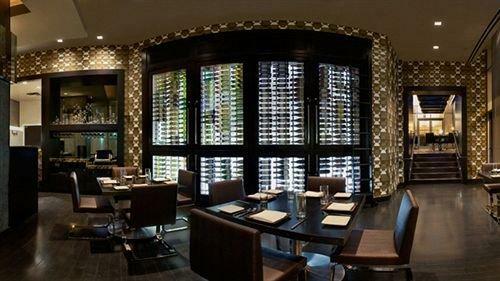 The Talbott is another luxury hotel in the extremely sophisticated Gold Coast area. The road leading to the hotel is lined with lush green trees and surrounded by high rise buildings. The hotel features 149 rooms spread out across 16 floors. The hotel has a rather warm and homely vibe with mahogany walls, warm fireplaces, and portraits of horses lining the walls. The rooms of the hotel mostly feature a brown and beige color palette. The rooms are quite modern and come equipped with their own Apple Mac mini, with a strong WiFi connection, and iPod docks. Coffee machines are also available in all rooms. 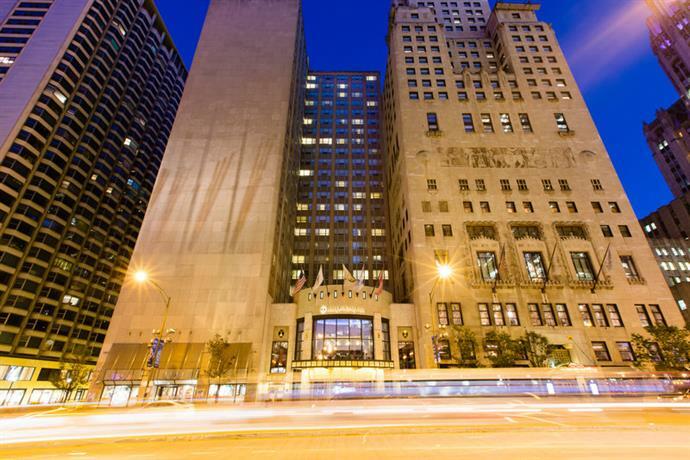 This luxury hotel is located in the middle of Magnificent Mile, which is one of the most popular shopping streets in all of Chicago. 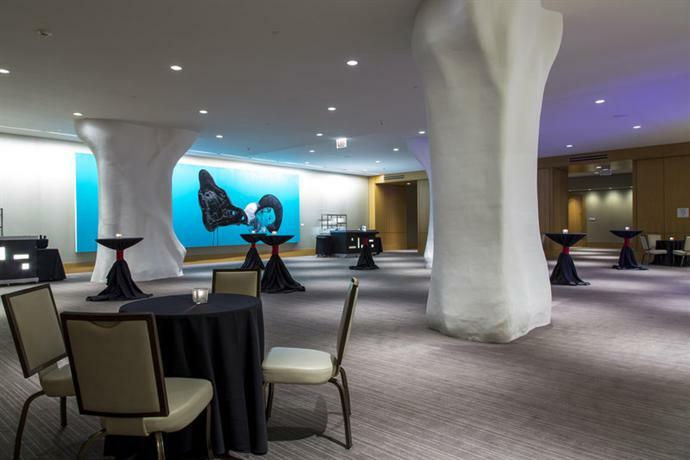 The hotel is located in the midst of all the life and action, just a few minutes away from The Loop, the Millennium Park, and even the L train. The hotel is 41 storey tall, and its base structure was built in 1929, with an onion-shaped structure crowning the top of the building. Architecturally, the hotel features design elements from Egypt, Greece, and even the Medieval times, and it makes for a rich experience for those who are keen on architecture. The hotel features 792 rooms, and they’re all moderately sized with neutral shades, however they’re all comfortable and replete with all the necessary amenities. 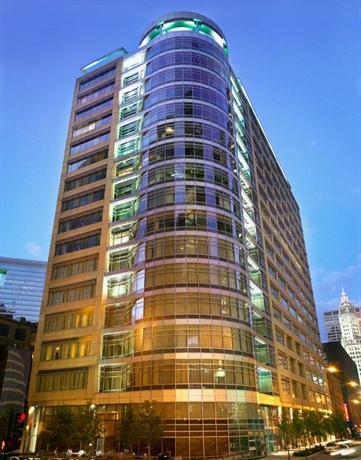 This hotel is located in the River North area and as such it’s surrounded by amazing restaurants and cafes. This is an extremely charming and artsy hotel, the lobby walls are lined with fun graffiti art made by local artists, and this quirky aesthetic even extends into the guest rooms, which are designed in a blue and grey color scheme with large windows to allow plenty of natural light to flood in. 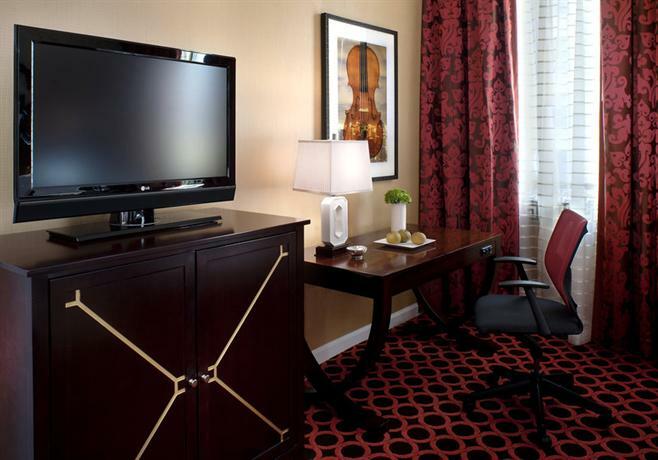 This hotel is located in the exteriors of the Loop, and as such it’s equidistant from the business district and from all the attractions of some of the more popular shopping streets in Chicago. The hall decidedly embraces a very feminine aesthetic with a lot of red velvet furniture, and pink blush hallways. 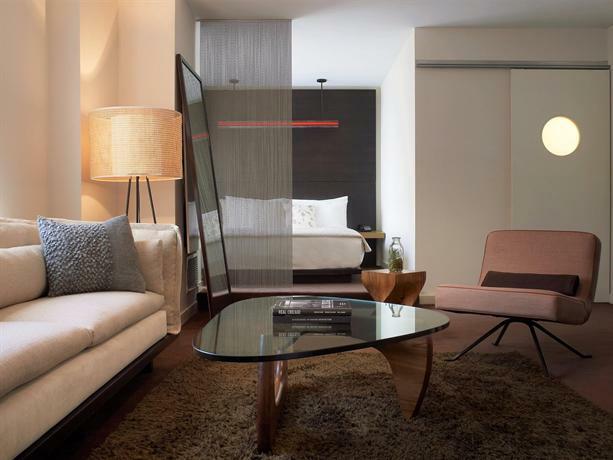 This boutique hotel features some of the most warm and lovely rooms in all of Chicago, the windows come with cushioned seats you can sit on to overlook the city, and the general aesthetic bears a pink and chocolaty color palette which is plain delicious to behold.